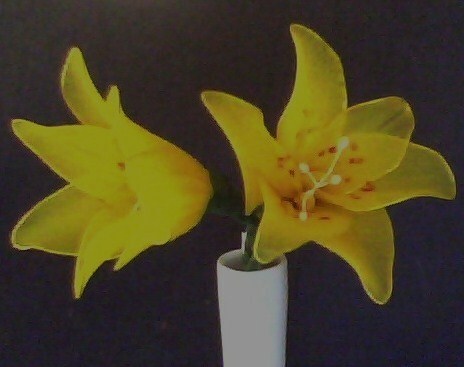 Lillies are very elegant and beautiful, in fact they add grace to any occasion. The large trumpet like lilly flowers are found in many different shapes and varieties, but they all have long tube like stems . The petals are different and some are plain even- edged ,some are pretty jagged , others are thin and spider like. Nylon stocking material in color of your choice. Wire and floral tape for stem. Thin wire for making flowers. Thread for tying the petals. 1 Make 3 small hoops or rings around 2 " wide . 2 Make 3 hoops of a larger size , 2" 1/2 "
3 Take stamens and pollen stalks and tie them to a hooked wire . 4 Wrap each hoop tightly with nylon of your choice with thread and pull out to form a tear shaped petal. 5 Start tying the smaller petals separately to the stem wire ,around the centre. 6 Next tie each larger petal in the gaps i.e. one small and one large petal . 7 Give a trumpet shape to the flower and also turn and pinch the petals slightly at the tip . 8 If one wishes then a few dots of dark brown dots can be painted on the petals near the centre. 9 Wrap the floral green tape round the wire stem . 10 The lillies are ready for display ! Prekrasno!!! I love nylon stockings! Hvala za upute o izradi!